“The power of CFD simulation in hands of designers – whenever & wherever they need it” is the part of simulationHub’s vision. In today’s era of product development, the first stage is to convert conceptual idea into its computer representation or 3D CAD model. This CAD model is then migrated to downstream domains like rendering, CAM, 3D printing, CFD, FEA and many more. 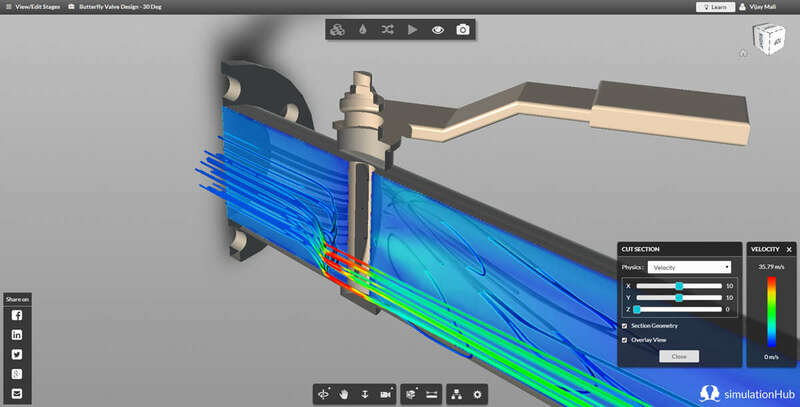 CFD simulation is one piece of puzzle in complete product design cycle. Simulation stage needs CAD model as an input. Along with simulation tool, designer needs CAD tool to design and optimize the product. Following is what I think as a product design cycle when it comes to design and optimization of the product for flow and thermal performance. To connect the dots and to give true power of “virtual realization of product” to designers, simulationHub and Onshape has come together. Onshape is full-cloud 3D CAD system. It gives designers an access to all that is required to convert conceptual idea into a 3D CAD model. 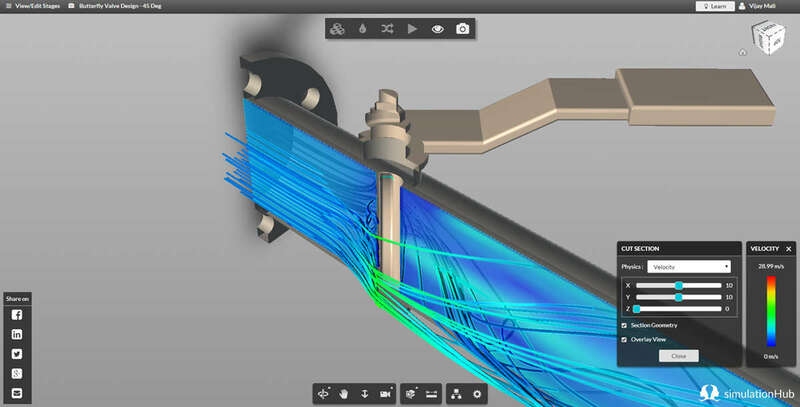 simulationHub is a cloud based CFD app which gives power of CFD simulation to designers. simulationHub is now available as an integrated app within Onshape environment. It has seamless integration with Onshape CAD data which recognizes and propagates design changes all the way to CFD simulation process. 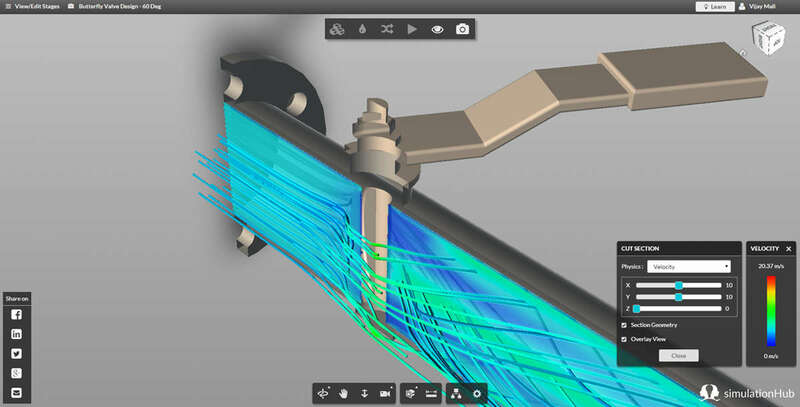 This seamless integration allows designers to carryout quick design iterations based on CFD simulation results. I thought of getting my first experience on Onshape CAD and simulationHub CFD integration. This blog is all about my experience on using this integration. I am not an expert user of Onshape or any other CAD software. My knowledge and work experience on creating CAD model is bit limited. So I thought of working on simple design concept and hence selected butterfly valve design. With some knowledge of what is sketch, what is part, what is extrude, revolve feature, I was able to generate the CAD model in 20 minutes using Onshape. Although, majority of my time was consumed in “beautification of the model”, it was fun converting my conceptual butterfly design into 3D CAD model. The model is not that elegant and you might see some modeling errors in live demonstration, but idea was to convert conceptual design in a relatively good and useable CAD model. After creating CAD model, I wanted to do CFD simulation for different angle of openings. To generate the model at different opening conditions, single rotation attribute was defined for valve. 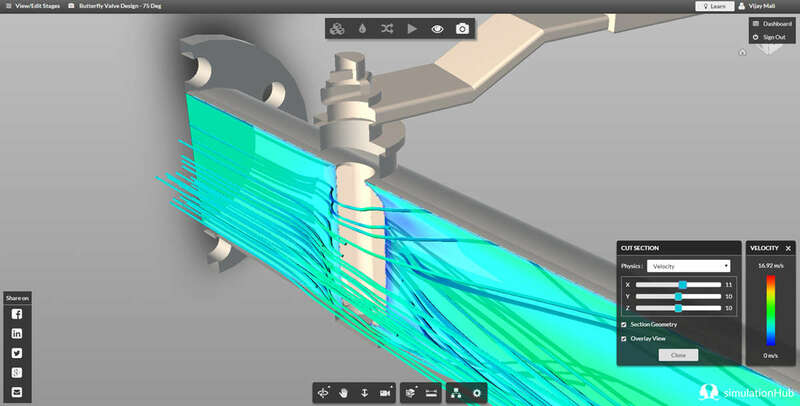 To do CFD simulation at 30 degree opening, valve geometry is rotated by 30 degree. simulationHub is available as integrated app within Onshape. The application is added using “Add Application” option. 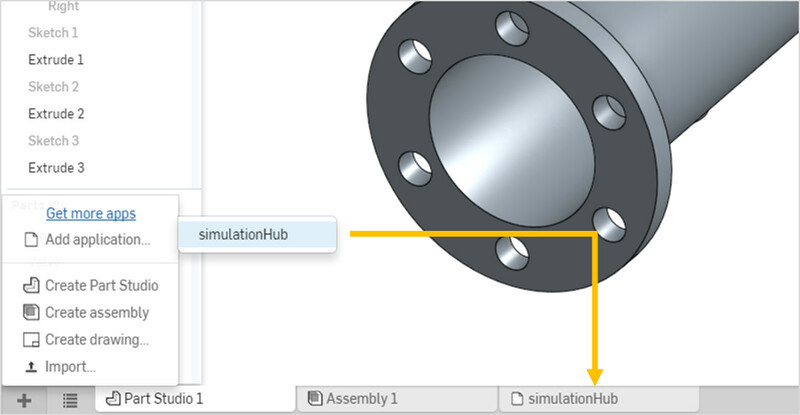 A new simulationHub tab is added within Onshape environment. Once the simulation name is given, the valve geometry with 30 degree opening is transferred to simulationHub. Further process of extracting fluid volume, setting up boundary conditions and simulation run is followed in simulationHub tab. For each opening angle, the simulation process took about 4 minutes of time. Same procedure is followed for other openings. The process of CAD modeling and simulation for four different angle of openings took about 43 minutes. 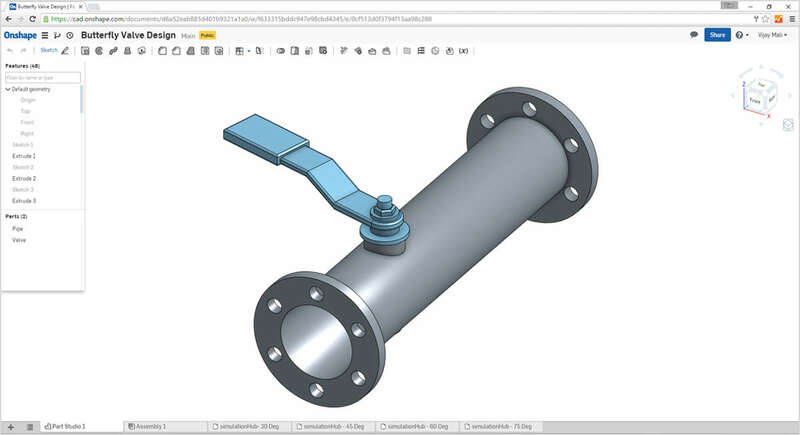 Below is the video of live demonstration on how design and simulation for butterfly valve is done using Onshape and simulationHub. This video is a live demonstration of creating 3D CAD model using Onshape and CFD simulation using simulationHub integrated app. 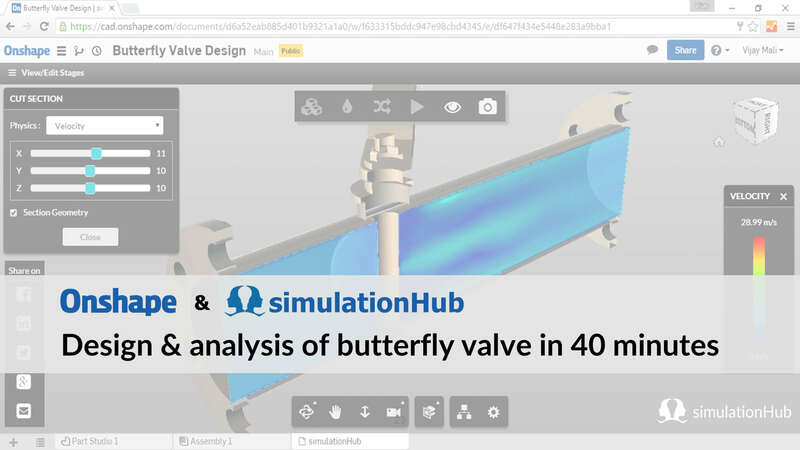 This covers how to create butterfly valve geometry using Onshape and do CFD simulation using simulationHub. CFD simulation for four different opening angle 30, 45, 60 and 75 degree are conducted. CFD results are presented with quantitative values like velocity and pressure. The qualitative data like flow lines, velocity and pressure contours are available on cut sections. NOTE : The video demostration uses older version of Generic Simulation app. Both Onshape and simulationHub has full capability free versions available. Create your FREE Onshape and simulationHub account. To use simulationHub inside Onshape as integrated app, you need to add simulationHub app to your Onshape account.